Miles Jonathan Austin III was born June 30, 1984 in Summit. Miles and his sister, Jennifer, grew up with their parents in Garfield. He was fast, strong and coordinated—a standout in youth league basketball and football, and later in track. At Garfield High, Miles became a shutdown defensive back for Tony Kostelnak’s varsity his junior year and was also a talented pass-catcher. He was an All-State receiver and defensive back as a senior, picking off 10 passes. He also starred for the Boilermakers’ basketball and track teams, specializing in the javelin and triple jump. Miles was not considered a big-time college prospect. He ended up staying in-state, attending Monmouth University on a football scholarship. Miles was an impact player almost immediately. As a sophomore he set a school record with 12 TD catches. In all, he caught 150 passes for the Hawks and scored 33 touchdowns in four varsity seasons. Miles’s combination of speed, leaping ability and precision route-running earned him an invitation to the NFL combines in 2006, but he still went undrafted that spring. Convinced he could contribute in the NFL, Miles tried out for the Dallas Cowboys as a free agent. He made the club as a kick returner and special teams player. 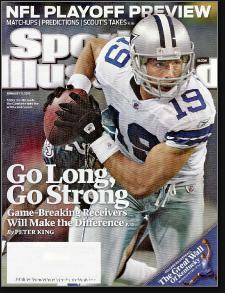 The Cowboys made the playoffs that year and he returned a kick 93 yards against the Seahawks. It was the first postseason kick return for a TD in franchise history. Miles spent two more seasons on special teams before getting his chance to start when Roy Williams was injured in October 2009. In his first game as a starter, Miles caught 10 passes against the Chiefs for 250 yards and two touchdowns. No one in NFL history had ever racked up more receiving yards in his first start. Miles amassed 171 more yards against the Falcons a week later, for a two-game total of 421—fourth-most in league history. He finished the year with a team-high 1,320 yards and 11 touchdowns in only 9 starts. The Cowboys locked up Miles with a six-year contract extension in 2010. He rewarded them with a 69-catch season and once again topped 1,000 yards. After the season, Miles played in his second straight Pro Bowl. Miles used some of his windfall to start a foundation that helps underprivileged kids through the Boys and Girls Club. He briefly dated Kim Kardashian. Injuries hobbled Miles for half the 2011 season, and his numbers fell dramatically, to 43 catches and 579 yards, although he scored 7 touchdowns. Three of those scores came in Week 2 during a 27–24 victory over the 49ers. Miles was still not 100 percent in 2012, but managed to rebound with 66 catches for 943 yards and 7 touchdowns. A sore hamstring in 2013 led to his most disappointing season as a pro and the Cowboys cut him the following spring. In 2014, Miles suited up for the Cleveland Browns. Bernie Kosar gave his permission for Miles to wear #19. He scored two touchdowns in his first three games with Cleveland. Injuries limited him to just 12 games, but he still finished with 47 catches, good for second-best on the Browns. The 2015 campaign found Miles with the Philadelphia Eagles. His production dropped off and he was nudged down the depth charts, eventually being released by the club after 11 games. He passed the 350career reception mark while playing in Philly.